What started out as an atrocious effort on behalf of the Penguins ended up a game of redemption. The Pens started out very weak and let the game get a little out of our hands. Then midway we made some changes in our game and get our act together. Then nearing the end our Two-Headed Monster took the game into their own hands and brought us to the very last possibly point and eventually a victory. Sound familiar? Sounds like a microcosm of last season, doesn't it? Oh the drama. So here's the real story. Brent Johnson let a few doozies in the Penguins net in the 1st period but totally redeemed his efforts as the game went on. So much so that it allowed the Sid and the Penguins to go to work in the 2nd and 3rd periods. Forcing overtime and standing strong along side Crosby's two goals and eventual shootout goal, Brent Johnson has earned a place in the hearts of Penguins fans. He's a beast. As I said above, the game started off very sloppy. Initially the game was a little slow (back and forth) in the first 5 minutes or so but then the Penguins allowed the Cats to get control of the game and eventually on the board first. After killing a Skoula penalty at the 4 minute mark, Goligoski goes to the box for crosschecking Kreps. A little extra pressure from the Cats and Steve Reinprecht slides a hot one past Johnson, [0-1]. The Pens only ended up getting 2 shots on goal in the first 13 minutes of the game. You can see from the pic below they had 8 shots total, though maybe one was anything decent. On a side note the Pens did do a serious job at blocking shots in the first with 13. Goligoski and Skoula were laying the body down. Not much more to talk about after this. The period was quite depressing. Don't get me wrong, the Cats did a good job, but not comparable to how bad the Pens played. This is all we wanted to do, eat our hats. The Pens came out the gates nicely at the end of the first. It was a pretty even period as a whole, but what we did witness was the Pens getting the puck in deep and keeping possession in the Cats zone. 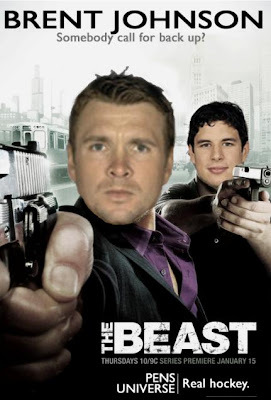 Though Vokoun decided to become a full time thief and robbed Geurin, Geno, Sid, et al. Crosby did attempt a nice backhand that went off the side of the post...shades of Geno's goal. Right after, it was Kunitz trying to get the crowd into it and drops the gloves with Keith Ballard. I'd say Ballard won the fight, but it still raised the energy level a little more. Johnson then ends up making a couple of great saves to keep the Pens it the game including a few breakaway chances. Staal heads to the locker room as Pens fans are holding their breath that he's not nursing an injury back there. Fortunately he bursts out on the ice in the third putting our worries to rest. Thought despite a stronger effort in the second, the Pens still remained scoreless. Right out the gates Geno was determined to make something happen. He takes off and protects the puck around the back of the Vokoun and draws a penalty on Campbell. A few chances later by Geno himself again and the Penguins find themselves on a 5 on 3 situation Olesz gets the same call as Campbell, hooking Malkin. This is where us Pens fans figured we had to see something produce. We almost saw one of the more amazing things from Sid with a rebound off the boards and an attempt to corral the puck between his legs. Shortly after we saw the first goal of the night from Sid. Geno makes what appears to be another turnover only to save the puck from heading out the zone. Gogo gets a hold of it and dishes to Crosby who takes a flatfooted one-timer, [1-2]. Finally! Life! After a little back and forth David Booth, who was excellent for the Cats, loses his stick and apparently thinks its okay to pick the puck up and toss it out of his zone. He's lucky the Pens didn't score on the powerplay lest he find himself even more scolded than initially. After this incident and penalty subsided the Penguins did see the puck enter the back of the net another time. However it was waived off and after further review was confirmed. If you enlarge you can see the puck was chipped in my Guerin. A no no in the NHL rule book. After which point there were some back and forth chances and just when you thought time was running out...Orpik interferes. Great. Or at least we thought to ourselves (great) with negative implications. That turns out not to be the case. Geno decides once again he's going to bring the puck around the net past Vokoun, and since he's perhaps the most dangerous one on one player in the league, he draws three kittens into himself and dishes to a wide open Crosby who gets his first shorty of his career...of his career? Nothing doing after this. I expressed the thought that at least we were going to get a point out of this. Again, or so I thought. Vokoun praying he doesn't lose the game for them. Johnson stops them all. Crosby makes Vokoun look like a school-boy and another 2 points for the Penguins. Sid played his 300th game and scored 3 different ways. Hmmm? Geno stepped up in the second and third and picked up two more points. First time in Franchise history the Pens won 9 games in October. 3 shootouts - 3 shootout wins. 3rd line played hard despite not getting on the scoresheet.